Calling all thinkers, tinkerers, and inventors! GPB Education will be live streaming from Georgia Tech’s Flowers Invention Studio in Atlanta, Georgia on Thursday, May 9, 2019, from 10 AM to 11 AM EST. This live virtual field trip will offer students an inside look into one of the nation’s leading makerspaces as they learn about the engineering design process, hear from Georgia Tech students, and see ideas transform into inventions. The program is aligned to Georgia standards and targets an audience in 3rd-8th grades. This event includes live interactive elements, such as polls and experts who are available to answer students’ questions. Use the hashtag #InventionLive to participate in the conversation. The exploration will be live streamed on gpb.org/invention and will be televised on Georgia Public Broadcasting. Invention Live will be available on demand after May 9th with supplemental classroom resources for grades K-12. Students can explore the world of science and engineering with this collection from DESIGN SQUAD NATION. Use these resources to help your students gain a stronger understanding of the design process and the connection between engineering and the things we use in everyday life. The DESIGN SQUAD NATION Collection equips students with science and math skills, and lays the foundation they need to participate in engineering activities later in life. Coding is the new literacy! With ScratchJr, young children (ages 5-7) can program their own interactive stories and games. In the process, they learn to solve problems, design projects, and express themselves creatively on the computer. This science resource collection from PBS’ The Ruff Ruffman Show features teacher's guides, YouTube-inspired videos, digital games, and student activities in English and Spanish starring canine host extraordinaire, Ruff Ruffman. Ruff, along with his trusty assistants Blossom the cat and Chet the mouse, answers questions from kids, takes on challenges, and learns the value of failure—all while modeling science inquiry skills and learning about core science concepts. In this episode of Crash Course Kids, Sabrina talks to us about the Engineering Process and why we should do things in order, as well as many of the questions we should ask along the way. NASA's Beginning Engineering, Science and Technology, or BEST, introduces the principles of engineering to young audiences through hands-on, NASA-themed activities that apply the engineering design process (EDP) to solve problems and generate solutions. NASA’s BEST activities may be used individually or as a set, and are aligned to national content standards and frameworks. Content is available on the BEST website in multiple versions suitable for digital and print use – grades K-2, 3-5, 6-8. Activities may be used to supplement curricula in classrooms and out-of-school learning environments. Engineering for Good is a three-week, project-based learning unit for middle school science classrooms focused on developing solutions for negative impacts of plastics on the environment. Explore Engineering Is… , a collection of media resources that focuses on the intersection of engineering and science. The new national science education standards, the Next Generation Science Standards, emphasize engineering design as an essential part of science education. With the Engineering Is… collection, middle- and high-school students can learn about scientists and engineers working together across disciplines to investigate issues, make discoveries and develop solutions. Fast Forward is a video series from GPB that focuses on STEAM, Technology, Engineering, Art, and Math concepts in a fun, entertaining, and informative way by demonstrating how employees in businesses and organizations across the state of Georgia are applying the topic matter in their jobs. For decades, technology has helped to improve the lives of people with disabilities and injuries. In this PBS NewsHour lesson, students will learn about the invention process, including a new bio-medical device which allows individuals who cannot physically speak to type sentences by simply thinking. Students will then research a medical invention or procedure and create innovative ways to improve upon it. In this NewsHour lesson, students will learn how wildlife conservationists in Costa Rica are teaming up with law enforcement to catch poachers by using 3D-printed plastic eggs with GPS trackers. Using the invention process, students will research different ways to curb poaching of wildlife and design their own prototypes to help solve this global issue. This product development activity from Discovery Education asks students to develop a thermometer than can detect changes in temperature in a given range. Students follow the engineering design process to develop a solution. *GPB is proud to offer Georgia teachers Discovery Education Streaming Plus services. Please contact us at education@gpb.org to set up your free account. Teachers and students can use #InventionLive to ask our experts questions and join the conversation on Twitter and Facebook. Enjoy the sounds of the symphony with GPB’s live exploration of the Atlanta Symphony Orchestra. This hour-long virtual field trip offers students a behind-the-scenes experience as they learn about the science of music, hear pieces performed by ASO, and interact with members of the Atlanta Symphony. Discover one of the last frontiers of true Georgia wilderness with GPB’s live exploration of the Okefenokee Swamp. Witness the power of the mighty alligator, hear from swamp experts as they answer questions from the audience, and test your knowledge of the Okefenokee with this hour-long program. 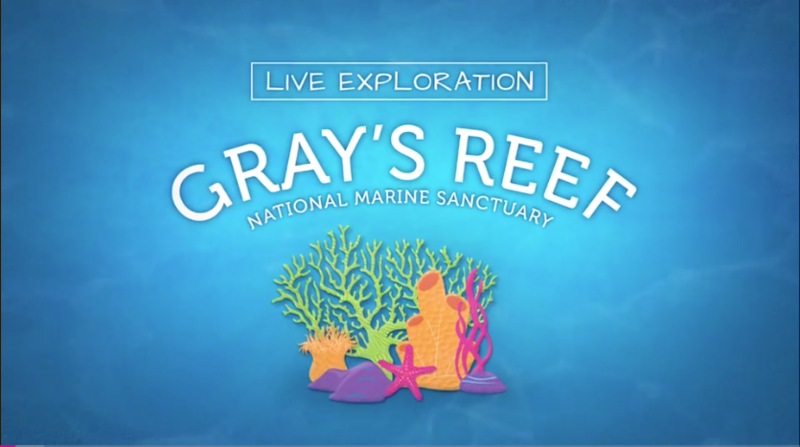 Take your students on an exploration of Gray’s Reef National Marine Sanctuary in this 30 minute virtual field trip. This event was live streamed on May 10, 2017, from the University of Georgia’s Marine Education Center and Aquarium in Savannah, GA.